Llandudno’s developing status as ‘the queen of Welsh resorts’ gained extra impetus in the summer of 1890 when its played host to Elisabeth the Queen of Romania (1843-1916), the wife of Carol I (1839-1914), King of Romania since 1866. Arriving on the Royal Train of the Prince of Wales, the queen stayed in the Marine Hotel. The day after her arrival she was visited by Lord and Lady Mostyn and they remained her close companions for the remainder of the visit, regularly escorting her on her excursions. 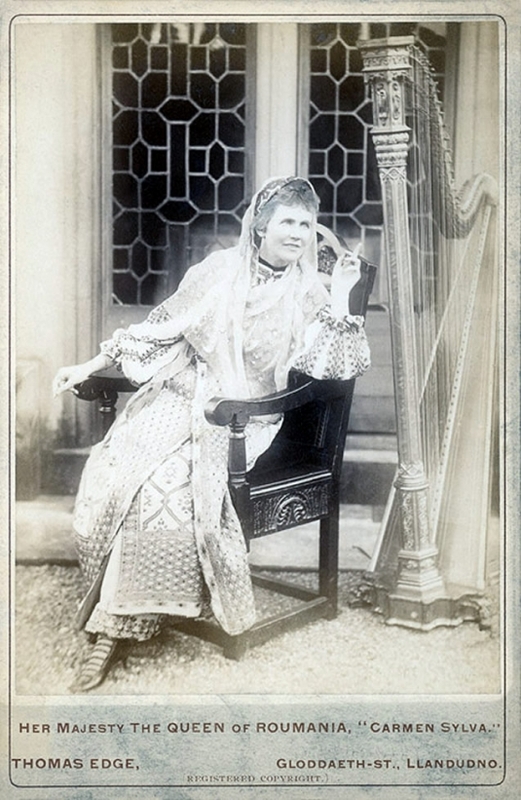 During her visit, as well as enjoying the landmarks and attractions Llandudno had to offer, she visited Gloddaith hall, regularly attended Llanrhos church and travelled to Bangor to experience the National Eisteddfod. An accomplished poet, novelist, playwright and artist in her own right, under the alias of ‘Carmen Sylva’ she could competently produce works in the German, French, Romanian and English languages. She was also proclaimed a Bard at the Eisteddfod. Her visit was considered to be a fitting tribute to the progress and style of the town’s continuing development. On her departure she described the resort as ‘a beautiful haven of peace’. This description was later translated into Welsh and adopted as Llandudno’s official motto – ‘Hardd Hafen Hedd’. Her acclaimed visit was also commemorated by the naming of three streets in the town: Carmel Sylva Road, Roumania Drive and Roumania Crescent.